Renewable diesel is an alternative fuel that is chemically similar to petroleum diesel and nearly identical in its performance characteristics. 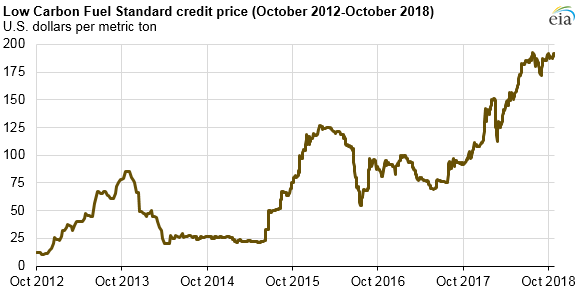 This article was published by the US Energy Information Administration on Nov. 13, 2018. 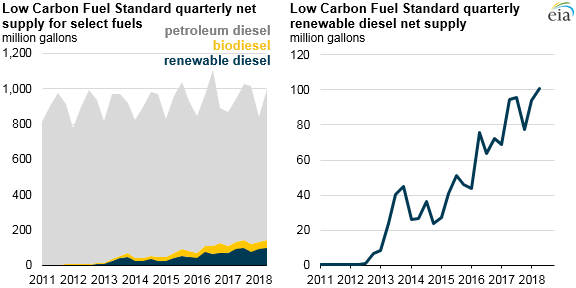 Renewable diesel net supply to California’s fuel market has increased since the state’s Low Carbon Fuel Standard (LCFS) program went into effect in 2011, reaching 100 million gallons during the second quarter of 2018, or 10.1 per cent of the total diesel supplied to California that quarter. 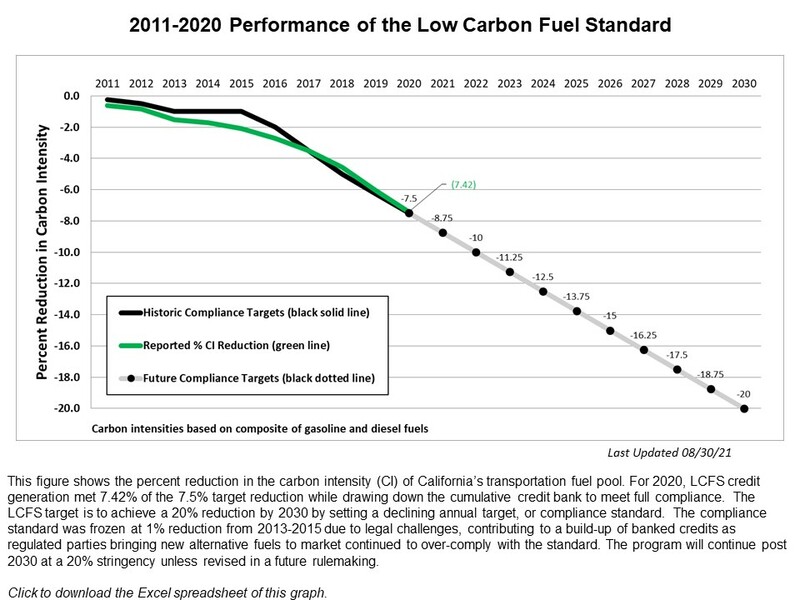 The LCFS program, which is administered by the California Air Resources Board, sets standards to incrementally decrease the carbon intensity of motor gasoline and diesel fuel by at least 10 per cent by 2020 relative to a 2010 baseline. To comply with the LCFS, petroleum refiners, importers of motor gasoline and diesel, and wholesalers of motor transportation fuel are required to either produce low carbon fuels or purchase credits to demonstrate compliance. The mechanism used to regulate the LCFS is a measurement called carbon intensity, which is an estimate of a fuel’s lifecycle greenhouse gas emissions. Transportation fuels with a carbon intensity lower than the annual standard earn credits, while transportation fuels with a carbon intensity higher than the annual standard earn deficits. Regulated parties trade credits through the online LCFS Reporting Tool and Credit Bank & Transfer System. The credits generated by renewable diesel producers have some of the lowest carbon intensities of any of the LCFS-approved liquid fuel pathways. The average carbon intensity of renewable diesel, measured in grams of carbon dioxide equivalent per megajoule (gCO2e/MJ), has been about 30 gCO2e/MJ since spring 2016. Much of this low carbon intensity fuel is made from used cooking oil feedstock. Compared with other liquid transportation fuels, renewable diesel’s carbon intensity is approximately 20 gCO2e/MJ lower than ethanol and about equal to the average carbon intensity of biodiesel. Ultra-low sulfur diesel, which accounts for most of the diesel supplied in California, has a carbon intensity of 102 gCO2e/MJ. Under the LCFS program, renewable diesel generates a large number of credits relative to other fuels because it has some of the largest lifecycle greenhouse gas reductions compared with other fuels. 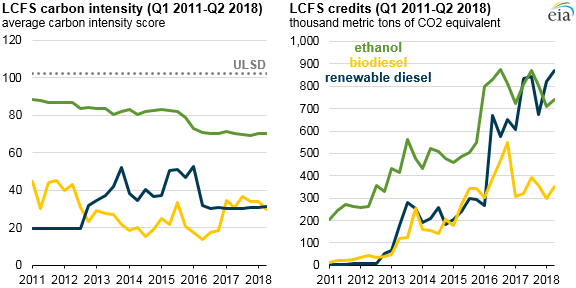 The total volume of LCFS credits associated with renewable diesel exceeded that of fuel ethanol for the first time in 2018, reaching about 870,000 mt of carbon dioxide equivalent during the second quarter of 2018. While renewable diesel imports from Singapore remain significant, planned renewable diesel production capacity additions during the next several years have the potential to increase the share of domestic renewable diesel in the California market. A number of LCFS amendments are slated to go into effect in 2019, including an extension of the program to increase the total reduction in carbon intensity to at least 20 per cent by 2030.